There is something irresistible about listening to the manner in which bassist Rob Clutton shepherds this music by The Cluttertones, using the bluegrass picking of the banjo by Tim Posgate and the elementally sad vocals of Ryan Driver together with his frequent manipulation of an analogue synthesizer all of which is woven into the wild atmospherics and free improvisations of Lina Allemano’s trumpet together with Lee Pui Ming’s piano and voice. It is an affirmation that they are bound by the belief that the inner dynamic of tradition is always to innovate. And innovate they do with this defiantly provocative music that puts the trumpet in creative conflict with a synthesizer and the piano in conflict with the bass, the human voice and of course the trumpet and the guitar too. But this is no pastiche of archetypal proportions. By actively throwing overboard melodic, structural and harmonic hooks that have become expressively blunted through overuse, Mr Clutton and The Cluttertones – together with Miss Ming, who flings herself into the depths of innovation in her pianism as she worships at the altar of creativity – as together they build from what might- or might not – be left of the elements of music. And yet melody and harmony are reborn and coexist with almost instinctive radicalism as instrumentation is sometimes brutally disjointed, then shredded and made whole again with sublime musical device and gesture into agitatedly ticking motor rhythms, volatile white noise all ignited in an acoustic and electronic soundscape that is wrenched from each instrument, and sometimes glued together by the human voice. 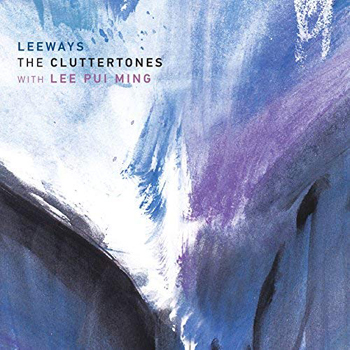 The defining moments of this approach to music come in the pivotal “Leeways”, a suite of five parts written, it would seem, expressly to bring the piano of Miss Ming into this extraordinary music that The Cluttertones have been making for the first half of this recording. Beginning with the hushed sonorities of Miss Ming’s piano at the edge of audibility Mr Clutton’s music generates structural arcs that provoke extended instrumental techniques from the piano (and the other instruments led by Mr Driver’s compendium of electronic keys and knobs, Mr Posgate’s guitar and the rest of the instruments) to shatter the score. And long passages of Miss Allemano’s trumpet rip the score apart by abrupt scrapings, while manic staccatos send melodic cells scattering to the outer limits of our ability to hear them. This is not easy music top nail, but no group could perform it better than the musicians of The Cluttertones. If the sounds Mr Clutton hears in his inner ear move off the radar of conventional instrumental timbre, Lina Allemano, Tim Posgate, Ryan Driver and the inimitable Lee Pui Ming unerringly zone into Mr Clutton’s intentions, realising his ideas faithfully.